As a public establishment, your bar or restaurant surely sees a lot of diversity. Customers of all shapes, sizes, orientations, and nationalities, with an abundance of different characteristics, stroll in wanting to take advantage of the services and menu items that you offer. But, what about the customer who is using a wheelchair? Or the one who is blind? Or the one who is using a specialized device to communicate? Do you have the accessibility at your bar or restaurant for these customers to take advantage of your services and menu like everyone else? Regardless of how you answer this question, as a public establishment your goal should be to serve all people, including individuals with diverse needs. Accessibility is a topic of increased interest among bar and restaurant owners because it’s one that most owners know little about. So, we’re here to help! 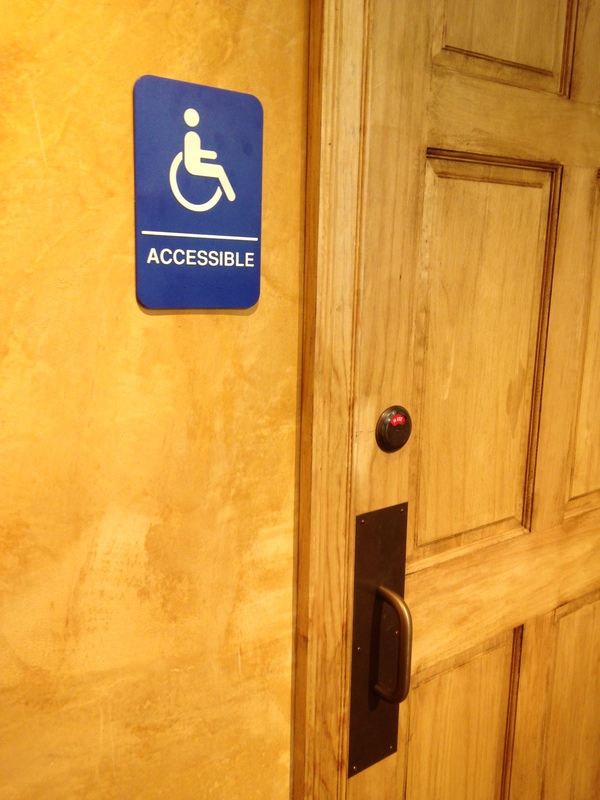 In this three part blog series on accessibility, we will give you the information that you need to welcome a diverse clientele into your establishment whether they walk in, are guided in, or roll through your door. Today’s article will focus on interior considerations within your bar or restaurant, including the aisles and walkways, seating, tables and counters, interior doorways, restrooms, and other important areas that need addressed. Part two will focus on important exterior considerations like routes of access, ramps, parking and drop-off areas, and entrances with a focus on appropriate terminology. And finally, part three will focus on employing individuals with disabilities as well as communication with customers and employees using person-first terminology. New facilities, constructed after the ADA, must make their facilities readily accessible. Existing facilities, constructed before the ADA, must remove physical barriers if readily achievable or easily accomplished without much difficulty or expense. The regulations do not define the specifics about what the “difficulty” or “expense” is, therefore the judgment is made on a case-by-case basis. It is possible that a facility does not have to remove a barrier because the law will consider the nature and cost, as well as the overall financial resources of the facility. If this is the case, it doesn’t mean that the change will never be made. Something that many not be readily achievable now may be later on. The good news is that most of the time a barrier can be removed by simply changing the physical environment, like adding a ramp when steps are the only means of entrance into a public facility. But, these physical improvements are not a one-time “fix.” Yearly re-evaluation of accessibility is imperative. The ultimate goal of the ADA is to give everyone the opportunity to benefit from the services and goods that businesses offer, as well as for businesses to benefit from the patronage of everyone. Following these requirements will make your customers feel welcome and allow them the freedoms that the law provides them. And as a bar and restaurant owner, you likely agree that regardless of who enters your building, it’s all about making the customer happy; every single one of them. 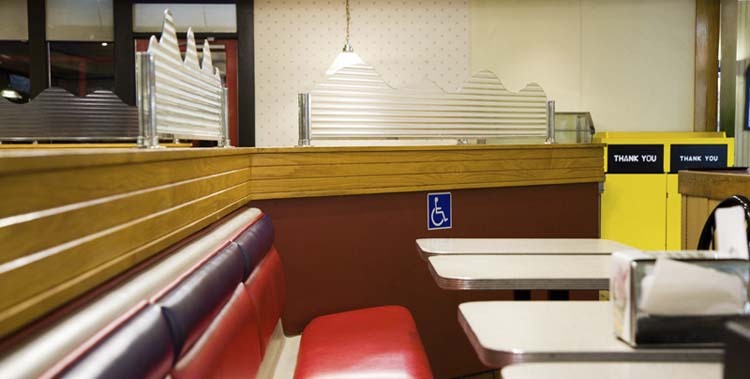 Bars and restaurants, as public establishments, are required by law to meet specific interior requirements so that their services are accessible to individuals with disabilities. The following is a list of interior considerations that are required in order to be ADA compliant. Please note; this is not a comprehensive list that includes every detail of what the ADA requires of all public establishments. Rather, this is a list of items that are most important for anyone who owns and operates a bar or restaurant. 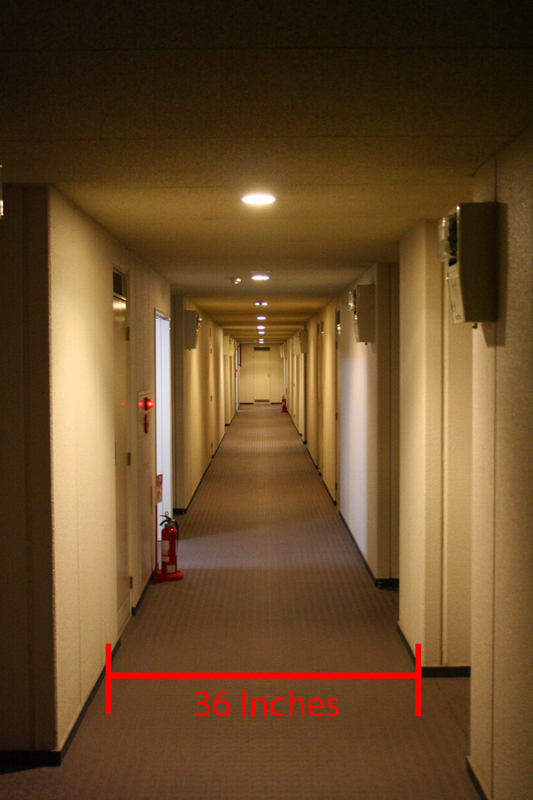 Aisles, walkways, or routes to public spaces must be at lease 36-inches wide. There must also be a 5-foot circle or T-shaped space available for a person using a wheelchair to reverse direction. Any obstacles located in any of the circulation paths must be cane-detectable. This means that any obstacle must be located within 27-inches of the floor or higher than 80-inches, or protruding less than 4-inches from the wall. Interior doorways must have at least a 32-inch clear opening with handles that are 48-inches high or less and operable with a closed fist. 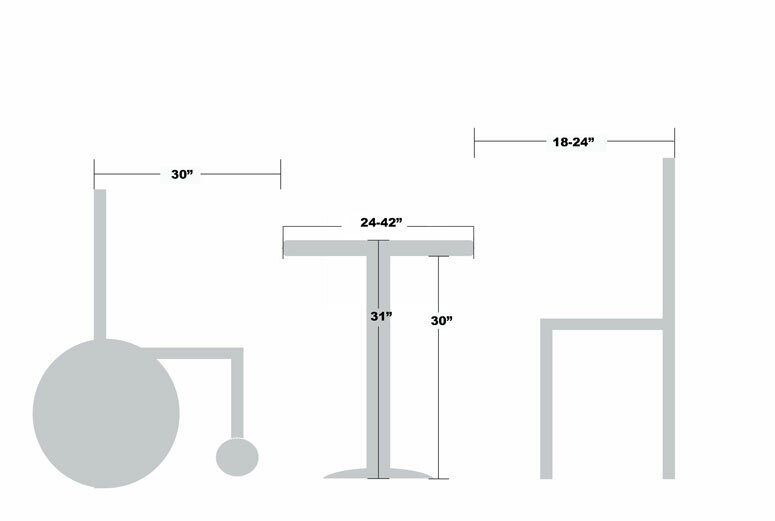 In order to accommodate wheelchairs, the height of the tables and counters need to be between 28 and 34-inches. For tables, knee room under the table needs to be at least 30-inches wide, 27-inches high, and 19-inches deep to accommodate a wheelchair. If tables are attached to the wall or floor (fixed tables), 5% of the tables (or at least one when less than 20 tables) must be accessible, if doing so is readily achievable. Accessible seating must be available at each accessible table for individuals using a wheelchair. Movable chairs can be used so that the chair can be moved and the wheelchair can take its place. Cashier and food ordering counters must be 36 inches tall or less or they must have a space on the side where restaurant staff can assist customers or pass food to a customer who cannot reach over the counter. 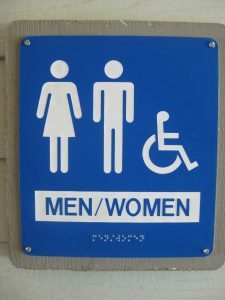 Restrooms must have at least one available restroom that is fully accessible with a sign located to the side of the door, 60-inches to center-line. Doorways must be at least 32-inches wide for clear passage with the interior having a 36-inch wide path to all fixtures. Restroom doors must be easily opened without more than a 5-pound force and have accessible handles that are 48-inches high or less. And, they must have a lever, loop, or other accessible handle that can easily be used with a closed fist. Accessible stalls must have at least a 5-foot by 5-foot area for a wheelchair to maneuver. Grab bars must be both behind and on the side wall nearest to the toilet with a toilet seat that is 17 to 19-inches high. Service animals used by a person with a disability must be allowed. Permanent signs must have raised letters or Braille text, must be positioned with the center-line 60 inches from the floor, and must be mounted on the wall adjacent to the latch side of the door. Emergency systems must provide flashing lights and audible signals to alert all customers. Whether you are building a new bar or restaurant, or remodeling the interior of your current establishment, abiding by the requirements set forth within the ADA is a must. These requirements assure that individuals with disabilities are given the equal opportunity to enter your establishment and enjoy your tasty menu items. Pair that opportunity with a welcoming atmosphere and we know your bar or restaurant doors will be opening to even more diversity every day. For more information on more specific requirements set forth by the ADA, please refer to the United States Department of Justice Civil Rights Division website at www.ada.gov.